Narrow Primary Feather Rachises in Confuciusornis and Archaeopteryx Suggest Poor Flight Ability. 2010. R. L. Nudds and Gareth J. Dyke. Science 328: 887 – 889. Abstract: The fossil birds Archaeopteryx and Confuciusornis had feathered wings resembling those of living birds, but their flight capabilities remain uncertain. Analysis of the rachises of their primary feathers shows that the rachises were much thinner and weaker than those of modern birds, and thus the birds were not capable of flight. Only if the primary feather rachises were solid in cross-section (the strongest structural configuration), and not hollow as in living birds, would flight have been possible. 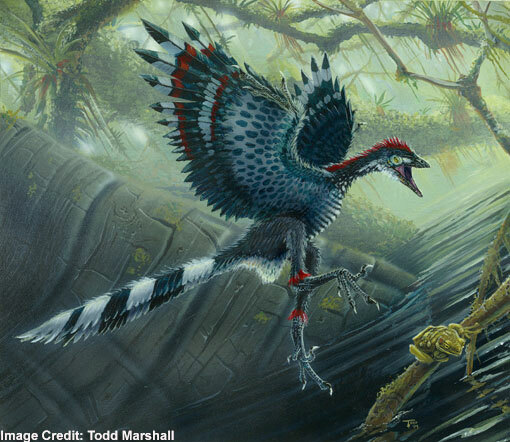 Hence, if Archaeopteryx and Confuciusornis were flapping flyers, they must have had a feather structure that was fundamentally different from that of living birds. Alternatively, if they were only gliders, then the flapping wing stroke must have appeared after the divergence of Confuciusornis, likely within the enantiornithine or ornithurine radiations.